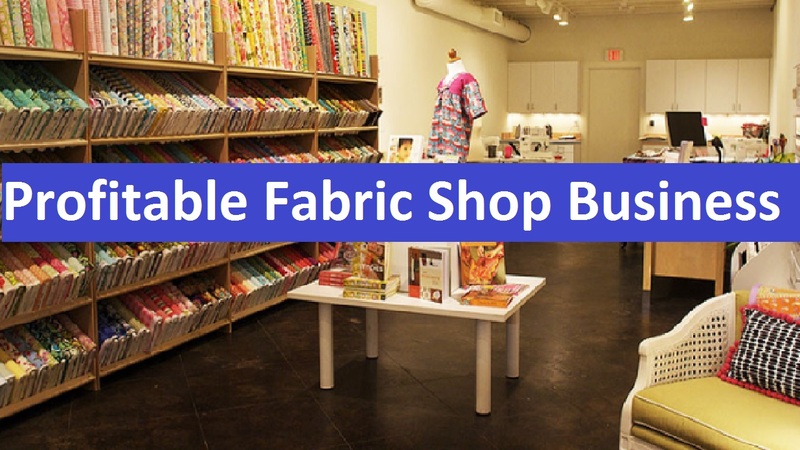 How to start a profitable fabric shop business? Sounds difficult and complicated? Don’t worry. It will become easy after you read this text. Fabric business is a very profitable business. Especially if you are a student of fashion designing or business section, it’s a great choice for you to start a fabric shop or store. If you are not a student of Fashion Designing then you may face some difficulties at the beginning. But worry not. Nothing’s impossible. You will learn everything if you work a bit harder than others’. First of all, what is most important about this business is to read and learn. Cause, you are entering a new world. There are already so many people working in this section. So you should make yourself a perfect figure for battling with them. By reading about business and fashion you will gather plenty of information. Gathering information will provide you a great help while starting your business. Try to pay attention how other people are handling and maintaining their business. Because you learn most perfectly when you experience things practically. Also, you will learn faster in this way. If you are a lazy person who dislikes reading, then experiencing practically would be the best option for you to learn. At this point, to gather practical experience, it will be better if you find a job in a fabric shop. Because there is no other way through which you can get practical experience. It’s the one and only way. But if you ask my opinion then I’ll say, reading will always be the best choice as it is the ideal way of learning anything. As you already know, nothing can beat education. So, after you gather enough knowledge about the business you are going to start, the second challenge comes. Don’t be afraid, you will be able to pass it like the first one. Here, in the second stage, you will need a place for your shop. And yes, of course, that will need money without a second thought. It’s much better if you have a store of your own, otherwise, you will have to buy one or rent one with money. In this case, if you are going to buy or rent a store but you don’t have enough money then you can borrow or take money loans. Cause it’s the fastest way to get money in your hands. You can pay it back after you make a profit out of your business. People often badmouth in situations like this. But never lose hope. And never think about giving up. Stick straight with your dream. You will become successful in that way. You may face some hardships at this point. But it’s okay. Because everyone goes through this stage while starting something new on their own. So, after you pass your second stage, you are almost ready to start your work but there are few more stages for you to pass through. And one of them is from where you are going to buy your fabrics and to whom or where you are going to sell them. You should confirm it at the beginning otherwise things will get all messy and complicated to organize and maintain. You can also buy fabrics from different places to know which one gives you the best quality. Even though it will be a bit expensive yet at the end of the day, quality is the only thing that matters. Because if you start your business with the quality products then people will get more attraction to your products. And it will be the fastest way to gain popularity absolutely in no time. When your business gets some familiarity with people you can try increasing it little by little. That’s the right time of taking advantage and make yourself well-known with people. You can also make your own designing clothes out of your own fabrics. And then sell it to the customers directly or provide them to different clothing stores. Both of these are good options for increasing your business. If you have confidence that you can make special exclusive clothe items then you can also make advertisement of your products. It will help you to let the people from all over the world know about your products. For that, your designs should be exclusive and attractive to grow interested in people’s mind to buy that product. While doing all these, you will be in need of helping hands. As you are trying to increase your business you, you just need a few men to help you. And, if you start designing your own clothes then you will also need a designer and one or two sewers. While selecting your designer and sewer you must pay close attention to their qualifications and skills. Don’t just hire anyone. Make sure to examine their skills in this line. Take your time while examining your workers. Because you will get hundred percent only when the people who are helping you are equally passionate and devoted to their works like you. You are paying them, so you must get the best out of it otherwise, you will not be able to progress with your business. It’s all related to each other. If you neglect one thing it will surely affect other things which can cause damage to your hard work. ‘Business’ the very word has a hidden meaning saying ‘competition’. So, when you enter the world of business you might prepare yourself to compete with others and survive by giving your best. At last, I would like to emphasize one thing and that is hard work. Never take things for granted. If you want to achieve something then make yourself determined about that. And work hard until you achieve your cherished goal. Don’t stop before that. Keep going and hard working until you gain your desired thing or goal.